Summer Trip to Downtown Disney Part 2: The Tech! So in Part 1 I talked about how we went to Downtown Disney and our plans didn’t turn out the way that we thought. But as a geek one of the coolest things about Disney is all of the tech that is used in their attractions. Let me start by saying that Disney uses tech not only in their rides and theme parks. There was a lot of technology being used as an attraction, like the animatronics of “Rainforest Cafe”or a giant Stitch statue that sprays water at people entering a specific shop. There was even more technology helping to provide a seamless experience for guests. From the music being played in certain areas to the ability to pay with your “Magicband” (a Disney invention that is a wristband which acts as your park ticket, hotel key, and credit card all in one). The most impressive piece of technology that allows for a major improvement was present before you even exited your car. Even before you parked. I chose to park in a newly constructed parking garage. Upon entering the garage, there were signs on each row, and on each sign was a small green number. It took me a minute to realize that this number was the number of open spaces available on that particular row. I chose a row and as I turned down I noticed that empty spaces had green lights hanging over them, while taken spaces did not have a light. After parking and getting out, I realized that our light had changed to red. 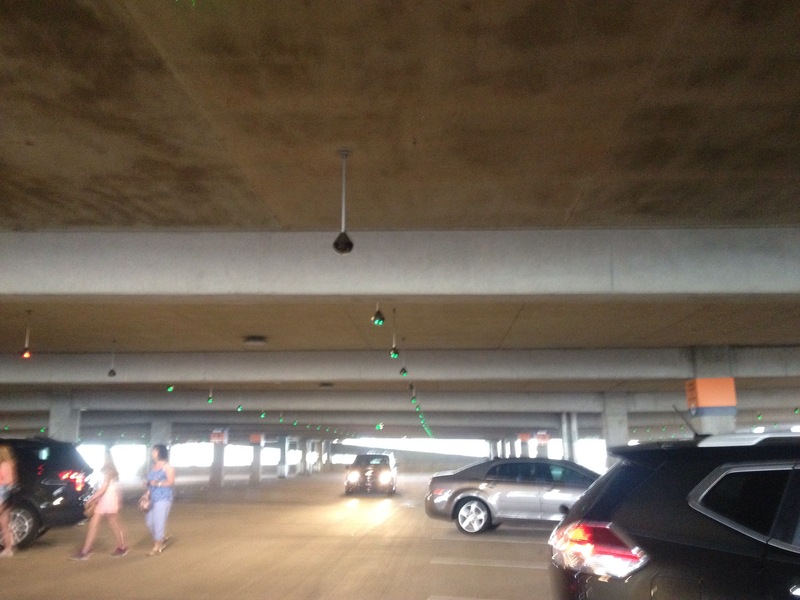 Upon further inspection it appears that they are using an internal sensor in the light to determine if the parking space is occupied, and then updates the number on the screen. As we were getting out of our car, we ended up taking up most of the area in the empty space next to us. Lo and behold, the light on the sensor turned red in that space too, warning drivers that there is something in that space too. Eventually the light above our car turned off, indicating that our space was staying occupied. Notice all the green lights hanging above the empty spaces. 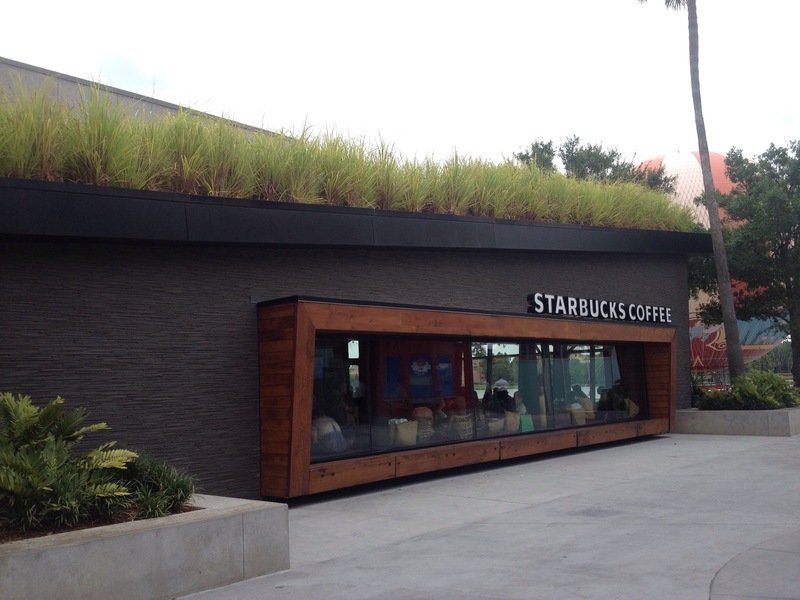 The other really cool thing that we found was a Starbucks…. Now I know what you are thinking. “Aren’t those things everywhere?” Yes they are, but not like this one! We sat and enjoyed some snacks and coffee, and a really cool screen. This screen had a camera and rendered the picture into an image that looked like a chalk drawing. 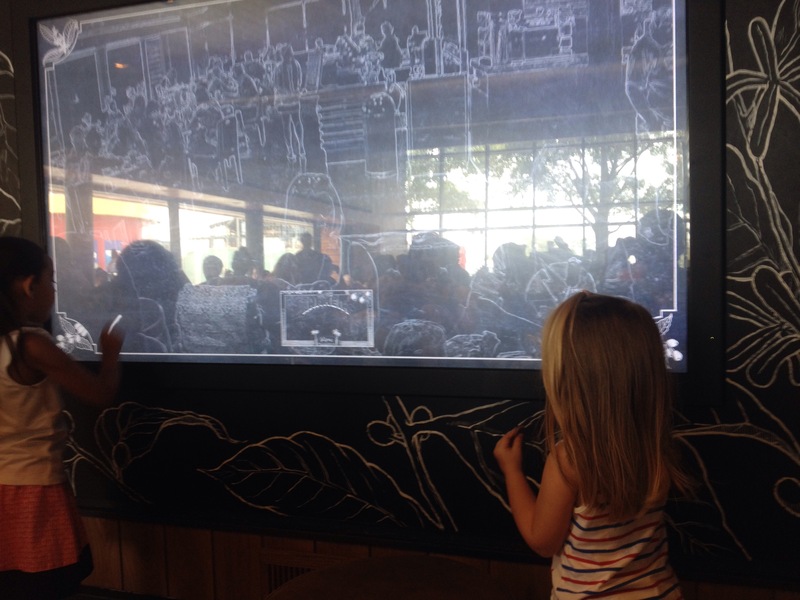 It was also a touch screen that kids can come draw on. 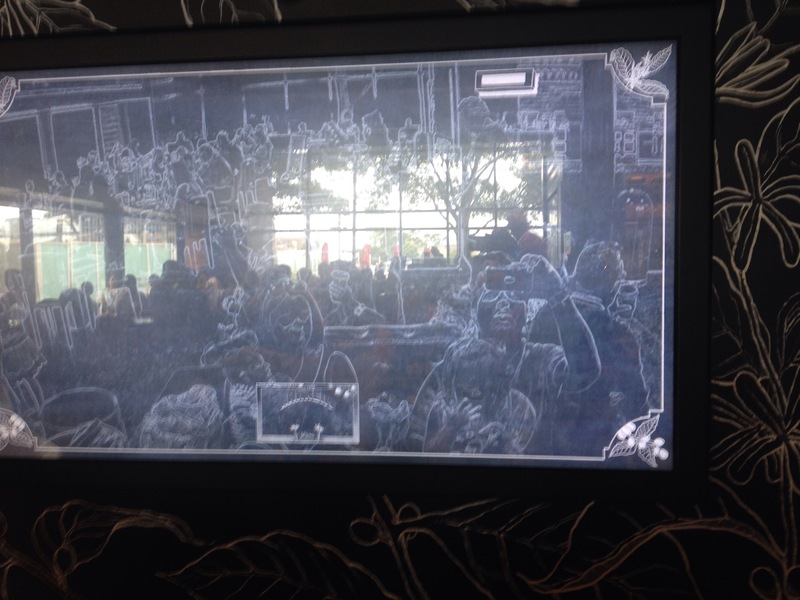 One final thing was that apparently the Starbucks at Disneyland in California also has one of these screens and we could see a live chalk picture from Anaheim. That is me on the right holding up the phone to take the picture. What is your favorite piece of Theme Park tech? Let me know in the comments section below. Also be sure to check out DadtheGeek on Facebook and Twitter. Summer Trip to Downtown Disney PART 1: The People! The main attraction for us wasn’t the shops, and it wasn’t the wonderful restaurants either. We were going for the balloon; a ride which resembles a hot air balloon, but is basically giant helium balloon which remains tethered and flies high above the Downtown Disney area. So we broke down and ended up taking her with the intention of going on the balloon. I wish that I could say that I, Dad the Geek, was better prepared for our trek, but alas, I wasn’t. I wasn’t prepared for the balloon to be grounded due to unsafe winds. I wasn’t prepared with a place picked out to eat lunch, nor with where we would be when the hunger would strike. The main thing that I wasn’t prepared for was beating the heat. This was the first time that we had braved an extensive outdoor area since Simon had been born. I felt really bad, but our strategy for keeping him cool was to simply stay in the shadows as much as possible and to duck into air conditioned shops when it got too much. It worked out, but If we had a better way to cool off the little man we would have been able to be a bit more flexible in what we could have done. All in all it turned out to be a great day and we all enjoyed ourselves, even though it didn’t turn out the way we had planned. How do you beat the heat when spending a long time outside during the summer months? What plans did you make that went completely wrong, but turned out alright. Let me know both in the comments section! Also be sure to Like on Facebook and Follow on Twitter. Zippers or Snaps? A Three Year Debate Continues! So, I have a problem. The debate that occurred three years ago when Claire was a baby has picked back up. Which design of baby onesie is of a superior design, snaps or zippers? In order to illustrate this problem, I am going to ask you to come along on an imaginary journey into my nightlife. In a previous post (Oh Sleep…) I spoke about the fact that my wife and I have not been getting very much sleep. When Simon wakes up for a late night feeding, both of us wake up. One of us will prep the bottle while the other changes the diaper, then one of us will stay up to feed while the other gets to go back to sleep. The issue apparently comes from the changing diaper aspect of this little story. Snaps – This is the position that my wife holds. The idea here is that the snaps allow you to uncover less of the child and therefore they are kept cozy and results in less yelling and a smoother transition to feeding and eventually back to sleep. My rebuttal is that the baby is screaming at you for food already. They are also kicking their little legs which makes snaps harder to fasten correctly, especially in your current sleep addled state. Zippers seem to be the most logical decision to me. A quick solution which cannot be mishandled, unless something goes drastically wrong and skin or fabric is gathered into the zipper (which I should disclose has NEVER happened in our house). The wife’s rebuttal again is the idea that the child screams more because most of their body is uncovered. Most onesies are made with the zipper running from one foot up to the neck, so in order to access the diaper, one must completely unzip the onesie. (I maintain that the kid still screams either way). This brings me to what has to be THE BEST INVENTION EVER! We have come across probably the solution to both issues, and surprise surprise a zipper is involved. The Wife and I are unsure if these are mistakes or if these are made somewhere and we can’t find them. They are zipper onesies where the zipper is reversed this it is quick, yet you can only uncover the area needed to change the diaper. So which do you think is better, zippers or snaps? Leave a comment below to weigh in on the debate. Also be sure to Like and Follow our social media pages. July the Fourth! LIVE TWEET ANNOUNCEMENT! Happy Fourth of July to all my readers in the U.S.
Also wanted to let you all know that I will be live tweeting and Periscopibg throughout the day next Tuesday. We are heading to Sea World Orlando! Join us!